The expansion of Port Moresby City will mean improvements to certain services to cater for the demand, including waste management. Eda Ranu, the city’s water and sanitation company is making improvements in this area with the expansion of its waste treatment pond behind the Morata suburb. The Managing Director Mr. Henry Mokono said this particular pond along with two others: one in Waigani and the other in Gerehu, take in three- quarter of the city’s waste. Therefore, the expansion and cleaning of the pond is significant in that it will cater for more waste from parts of the city. “The pond was built in the 1960s initially to cater for the waste coming from the University of Papua New Guinea,” he said. Today it caters for 100, 000 people, but with the expansion of the city means it must be upgraded as well. 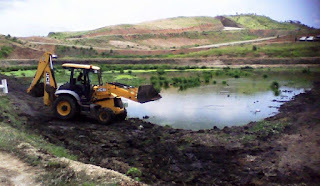 The pond also takes in waste from Ensisi Valley, Rainbow and parts of Gerehu and Waigani suburbs. The project was done at a cost of K300, 000 paid for by Eda Ranu and was commissioned today by the Managing Director.